As it is with the Mac mini, our forums and email addresses are replete with questions about the MacBook Air. AppleInsider tackles a few of the topics, and tells you what you can expect when and if you buy one of the new machines. The two Thunderbolt 3 ports will let me do what? 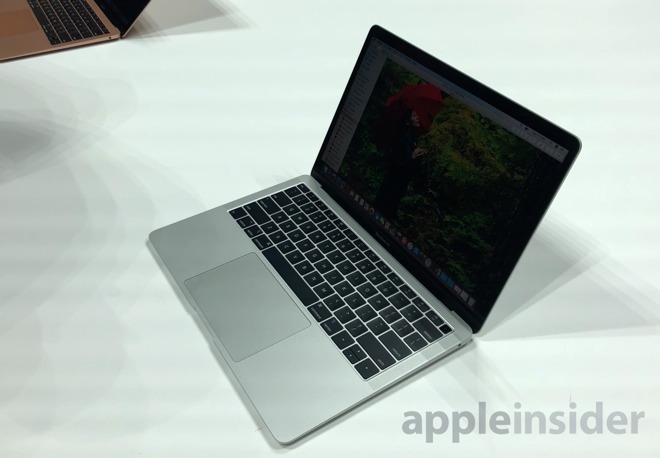 Thunderbolt 3 in the new MacBook Air in conjunction with the Intel UHD Graphics 617 can support one external display with 5120 x 2880 resolution at up to 60Hz or to two external displays with 4096 x 2304 resolution at up to 60Hz over Thunderbolt 3. There's also connecting high-speed RAID enclosures and the like. Of course, like with the Mac mini and the MacBook Pro, you could always hang an external GPU off of it and have loads of displays. Keep in mind, though, that one of these two ports needs to deliver power. Consider a dock of some sort, if you have a lot of things that need to be wired to the MacBook Air. What about that headphone jack, it is a combo or optical one? The jack is only a headphone jack. It is not a multi-function or optical jack. While the unit has three microphones built in, we don't recommend them for any heavy use. Instead, use USB, a dock, or an analog to digital converter of some sort. The MacBook Air in all likelihood uses the i5-8210Y processor, or a very close derivative. This is an interesting choice, as the processor family is generally used fanless. At Tuesday's reveal, AppleInsider was told by Apple employees on the demo floor that the new MacBook Air was fanless. However, the X-rayesque graphics that Apple used during the reveal on stage clearly has a fan. It remains to be seen how it will perform from a thermal standpoint versus the fanless installation in other products. We'll be looking at this when we get our hands on the hardware. The 13.3-inch LCD display on the new MacBook Air has a native resolution of 2,560-by-1,600 pixels, with scaled resolutions of 1680 x 1050, 1440 x 900, and 1024 x 640. However, the display does not support the P3 wide color gamut, like the MacBook Pro does. It does have a wider color range than the previous MacBook Air, with Apple claiming that it supports "48 percent more colors than the previous generation." What this means in practice, we're not sure yet. Can I hook up Apple's Thunderbolt display? Sure can. Apple's Thunderbolt 2 to Thunderbolt 3 adapter is all you need. In fact, you can daisy-chain a pair of them to that connection, if you want, but we suggest you use the Thunderbolt 2 female connections with your own cable to do so, as the existing one that's hardwired is too short for good placement in most installations. You won't get power back to the MacBook Air from the display, so you'll still have to tackle that somehow. Can I use the USB-C iPad Pro as an external monitor for the MacBook Air? This is still more about the iPad Pro than the Mac mini, but let's address it anyway. You can't plug in a USB-C to USB-C cable with no other software to do so at present, no. USB-C to DisplayPort or HDMI is a specific "alternate mode" negotiation, and it would require additional software at a minimum and hardware more likely in the iPad Pro to allow this. There are always software options like Duet Display that benefits greatly from a high-speed wired connection like USB-C will provide, or wireless solutions like AstroPad's Luna Display to do this. We're still getting a lot of questions about the new machine. As we collect questions, and gather answers, we'll update accordingly.